This time next week, The Genealogy Event will be underway in Adare, Co Limerick. The event, now in its third year, offers two full days (Friday and Saturday, 2&3 September) of talks on a wide range of topics including valuation records, passenger lists, handwriting interpretation, DNA, landed gentry, immigration and much more. The speakers include experts from universities, national institutions and genealogy companies as well as independent professional genealogists, so delegates can be assured of a great learning experience. 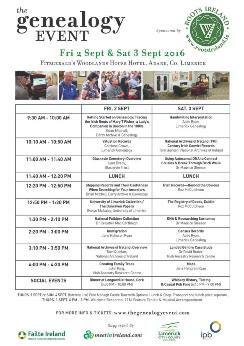 I'm delighted also to see Roz McCutcheon, a colleague from my days on the Council of the Irish Genealogical Research Society, is among the impressive line-up and will be presenting two talks; she is a very entertaining speaker and I know the delegates are in for a treat. As well as a seat at the lectures, a ticket to the conference includes a 15-minute consultation with a professional genealogist (one-hour sessions are also available for an additional fee), and a series of social events take place each evening, including a pre-conference reception. The conference venue is the Fitzgerald's Woodlands House Hotel and tickets are still available on the website. See the full programme to discover what's in store.